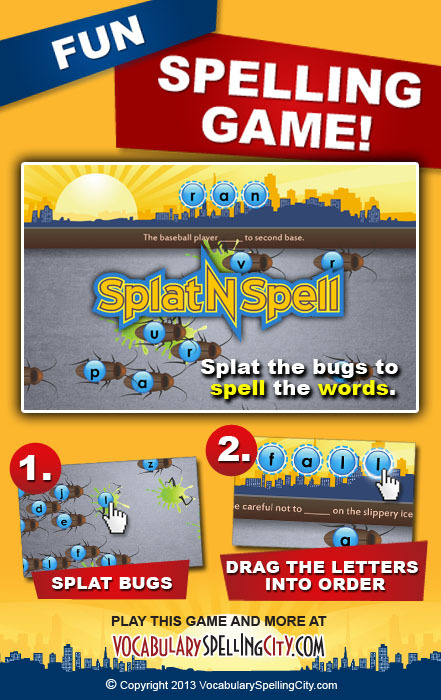 SpellingCity…Your Kids Will Love Studying Their Spelling Words – Happy. Homeschooling. Housewife. I was never good at spelling. Odd I realize, given the fact that I am an English major and taught English for many years. Nonetheless, spelling was never my thang. Actually, I remember quite clearly how I would purposely get the first word given to me at our spelling bee wrong just so I could sit down and help my teacher out (if you are thinking teacher’s pet your right). I enjoyed so much more being on the other side of that dreaded Bee Line. So now that my girls are having their own word list to learn I try really hard to not only rely on the method of practicing words that I was required to do (please, no offense to my beloved English teacher) which was countless hours (it seems) of copying the words in nice little rows. I believe at some point my brain stopped focusing on the words and their meanings and drifted out the window and into the clouds (yes, I was a big daydreamer). So I have gone to great lengths to find other methods. I like to play a lot of games with their words and have found that this method works for them. So when I discovered an online game they can do independently that is free, I became instantly excited. Spellingcity allows you to type in your child’s list, save them, and then they can go on and play a variety of games all for free. There is a membership you could get which will allow you complete access to the site which includes a variety of other games. We just have the basic free plan and it has been working well for us. The site is super easy to use which is a blessing. I spend about 20 minutes and add ten list at a time–so it is also time effective. Once you create a list it is saved forever or until you delete it, which is also nice. Study on the go? Yes, they have an app for that! So if you are looking for another FUN way to get your children to play with their spelling words, check out spellingcity and give it a try!